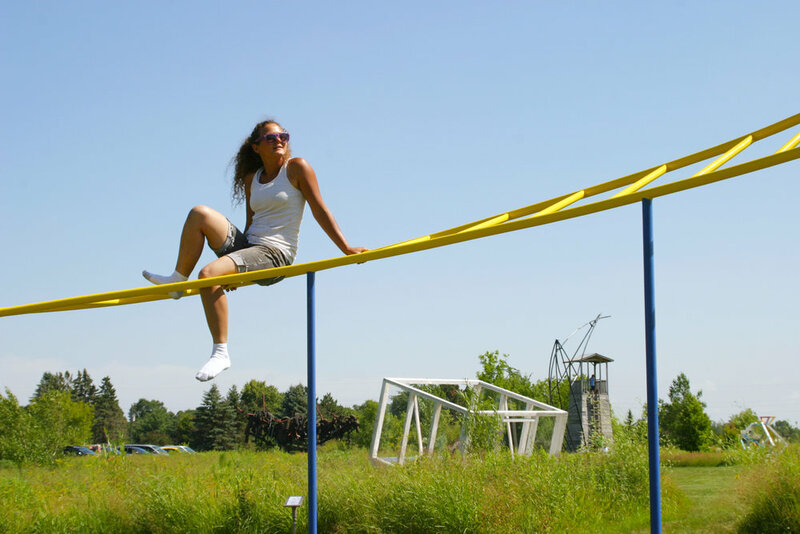 I created Infinite Play during my fellowship at Franconia Sculpture Park. This interactive structure takes the shape of jungle gym monkey bars that have been twisted into a Möbius strip. Möbius strips are 3D shapes with only a single surface, so a person could start at any point on my sculpture, and he or she would be able to climb along every surface of the sculpture without having to stop. Infinite Play presents park visitors with an interactive climbing loop that has neither beginning nor end points. Borrowing from the aesthetic vernacular of an existing playground activity, its call to action is instinctual and exciting. It is intended to be a framework for participants to define their own boundaries for play, as well as a symbol for unending possibility and delight. Infinite Play is a flexible site for imagination and achievement, a backdrop for both personal and interpersonal competition, where the impossible and possible just might meet. link to article: "Meet Risa Puno, Artist behind Infinite Play"